HSE Director General Tony O’Brien is to step down from the organisation tomorrow. With the CervicalCheck scandal deepening, Mr O’Brien has finally bowed to political and public pressure. In a statement the HSE said he made his decision “in order to avoid any further impact to the delivery of health and social care services”. The health body added that cancer screening services have become the focus of intense political debate in recent days. Mr O’Brien said he looks forward to engaging with the scoping inquiry set up by the Government into the case of Vicky Phelan and other women who were not told that opportunities to spot cancer cells were missed. Mr O’Brien said he has been proud to lead the health services and the many staff who have “worked tirelessly and with great dedication to provide health and social care services in a very challenging environment”. He also offered his “fullest support” to Health Minister Simon Harris. The minister thanked Mr O’Brien for almost seven years service at the top of the HSE. Mr Harris said: “I know that he is standing down from his role today because he believes it is in the best interest of rebuilding public confidence in the wake of the issues which have arisen in CervicalCheck. This follows Children's Minister Katherine Zappone publicly calling for the embattled HSE boss to resign earlier this evening. 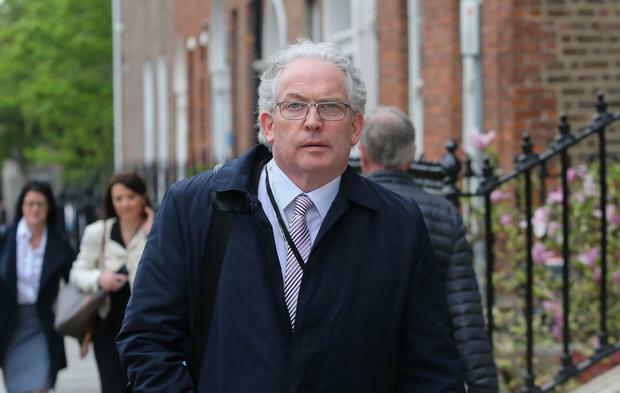 The Independent minister broke ranks to describe the latest revelations in the CervicalCheck scandal as a "game-changer". At Tuesday’s Cabinet meeting she privately expressed concerns about leaving Mr O’Brien in position but agreed to go along with the majority view that he should be left in place. However, she has told Independent.ie: "In the context of a Cabinet meeting I expressed the view that I felt that it would be important for him to resign his position or for the Government to ask him to stand aside. Her comments come after two major developments in the fortnight old scandal today. Firstly cancer victim Emma Mhic Mhathúna gave a heart-breaking interview in which she described the trauma of learning that her illness is terminal. The mother-of-five told the Irish Independent: "I shouldn’t even have had cancer and now I’m dying." Then at the Oireachtas Public Account Committee it emerged that the HSE compiled a series of memos on CervicalCheck’s audit process in 2016. They warned about women turning to the media and headlines that could read 'screening did not diagnose my cancer'. Speaking at a referendum event in her constituency tonight, Ms Zappone said the information which emerged at the PAC was a "game changer". "I hope it moves my colleagues to make a different decision [about Mr O’Brien’s departure]," she said. Ministers were due to hold an away day in Monaghan tomorrow to mark two years in Government but this has now been moved back to Dublin.